So, I get to stay in Project Run and Play – and let you see a new look Friday, hooray! 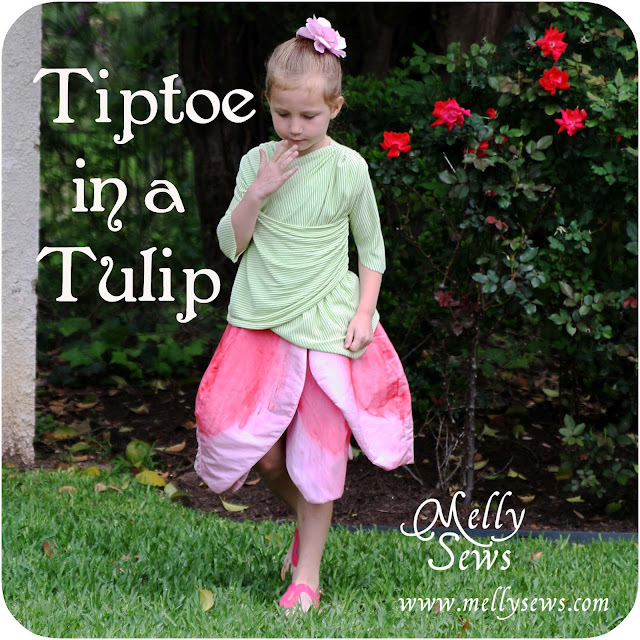 Meanwhile, lets talk about how I made the Tiptoe in a Tulip Skirt for my Week 1 look. 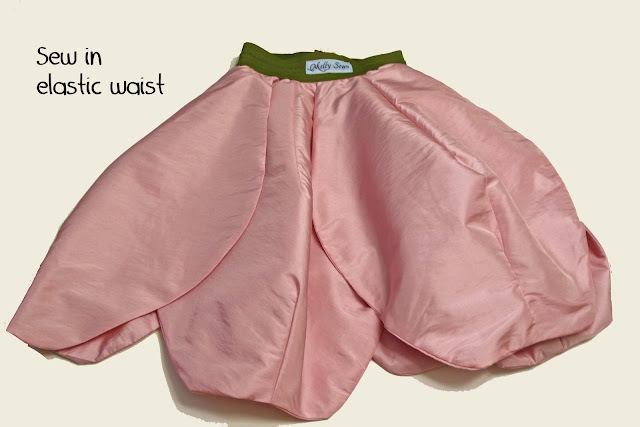 If you haven’t read Dana’s Circle Skirt Tutorial, start here. This skirt does begin its life as a circle skirt, with several changes. 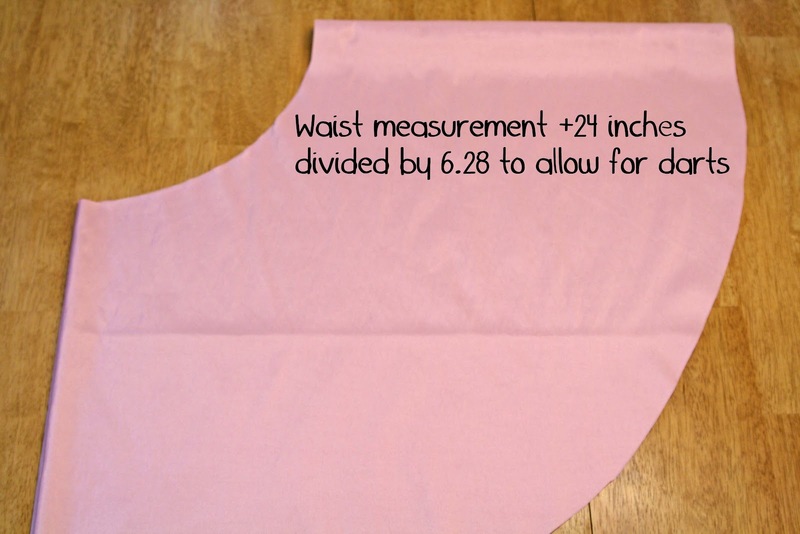 Important note – this kind of skirt will only work this way with 60″ fabric. I used nylon taffeta. 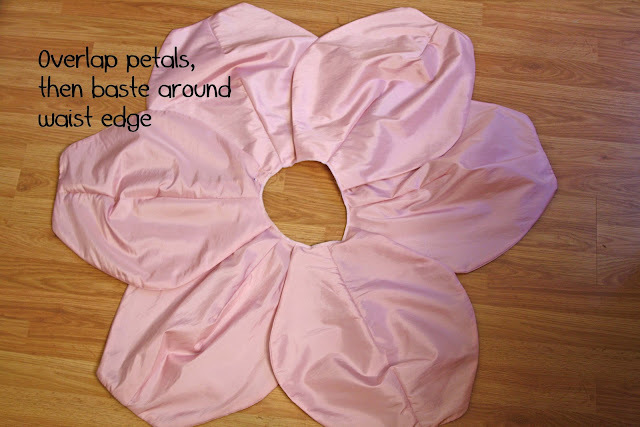 The fabric should also have some body without being too heavy, or you’ll lose the sculptural shape of the petals. Once you’ve measured your girl’s waist plus ease, add 24 inches for darts. Divide this number by 6.28, and cut out your circle. Repeat. You need two circles to make this skirt, so it’s quite a bit of fabric I used 2 1/2 yards of 60″ fabric in mine, which is 18 inches long. Next, fold your circle into 6ths. The easiest way I found to do this was to start with it folded in half, then to lap both sides over each other in thirds. 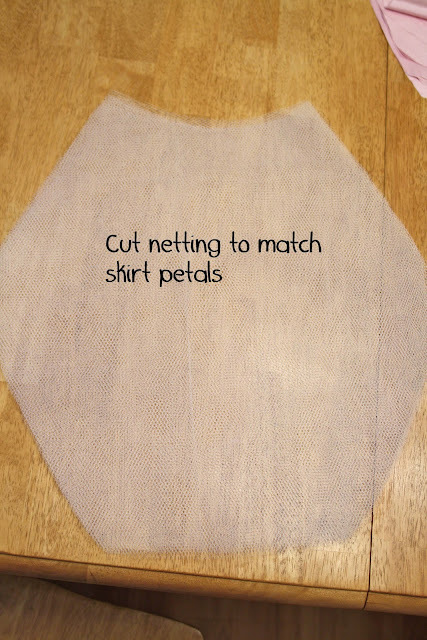 Mark out your petal shape (excuse my messy tracing – you couldn’t see my chalk lines in the photo very well) then cut it out. 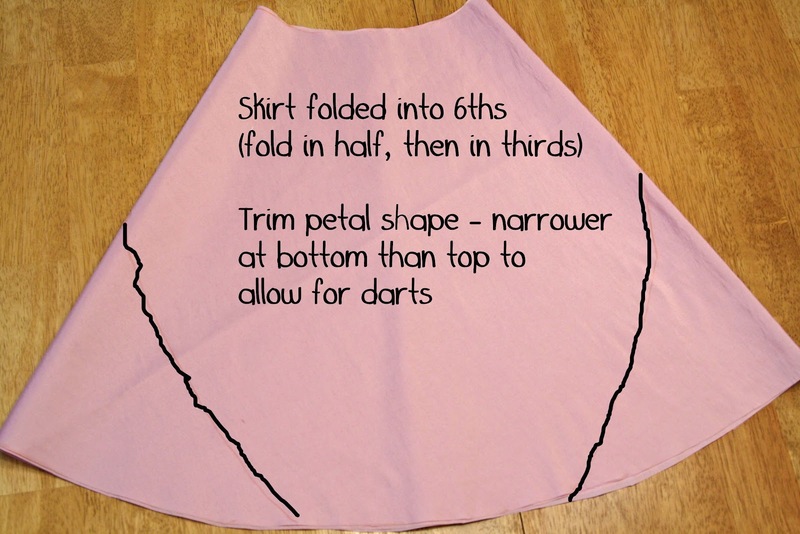 Make your petals much wider at the top than at the bottom, because the top darts are going to be much wider. After you trim the bottom, cut through the folded edges, so that you have 6 petals from each circle, or twelve petals total. Next cut your netting using a petal as the pattern – this needs to be the stiff stuff with wider holes that you find next to the tulle. 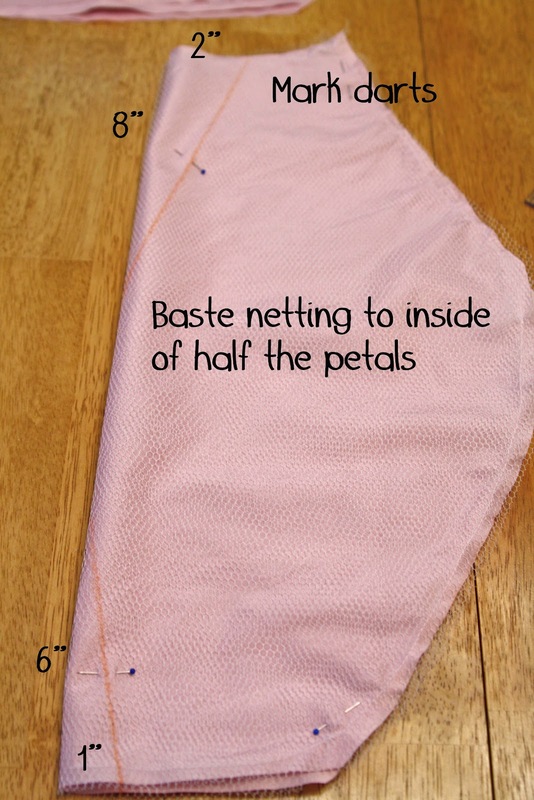 Baste netting to the wrong side of 6 of the petals. Next- darts. I used a ruler to mark my darts. First I folded each petal in half. At the top edge, I measured in 2″ from the fold and made a dot, then measured 8″ down the fold and made a dot, then connected the two using the ruler. I repeated with smaller darts at the bottom – 1″ in and 6″ up. 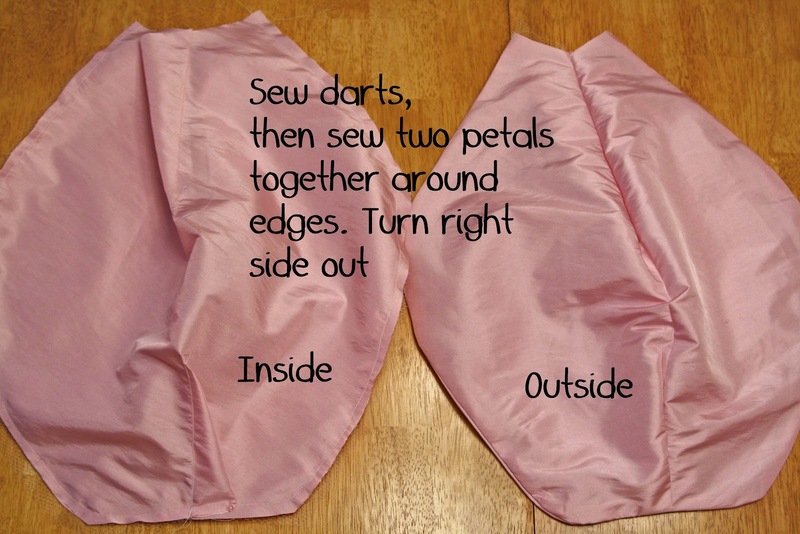 Sew darts in all 12 of your petals. Then, sew two petals wrong sides together, leaving the top edges open. Turn the petals right side out and press. When you have all 6 petals done, overlap them as shown, making sure the measurement watches your waist+ease measurement, and baste them all together around the waist line. Add the elastic waist the same way Dana explains. I hand stitched the petals to each other underneath, about 2/3 of the way down, so they wouldn’t split apart and reveal too much of the wearer. Finally, I added fabric paint. 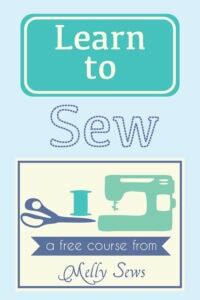 First, TEST on scraps of your fabric. I used plain old Tulip t-shirt paint, thinned with water. I applied with a wet brush, then rinsed each petal pretty quickly after applying the paint to get a watercolor effect and to make the edges of the color bleed. I painted one petal at a time, and made sure each one was mostly dry before doing the next. If I had been smart, I would’ve painted the petals before sewing them together, but the paint was a last minute addition. I had some blending help from an unexpected rainshower while the skirt was hanging to dry, and Mother Nature made prettier watercolor patterns than I had up to that point, so I started using more water on subsequent petals. 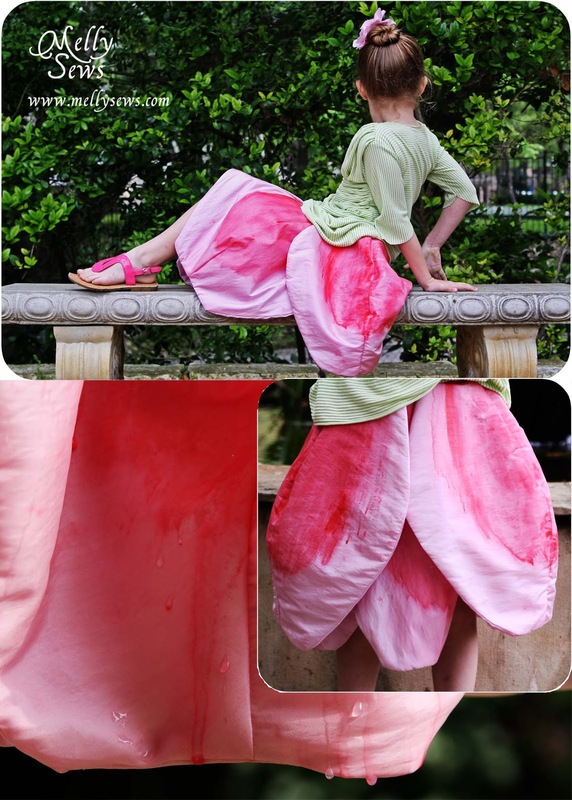 Since this was nylon organza, the water tended to run off the petals, taking paint color with it. I let it happen, but kept a close eye and a lot of paper towels nearby to blot when I thought the water was running too much. And that’s how I did it! Here’s another finished picture; there are also more here on my original post. This is absolutely STUNNING. 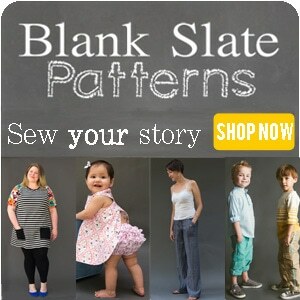 LOVE LOVE LOVE all of your designs. Beautiful. thanks for the tutorial !! LOve this skirt and going to purchase fabric next week but have a question…where did you add the extra 24″- was it to the waist? THanks so much for all that you share! You are incredibly talented. 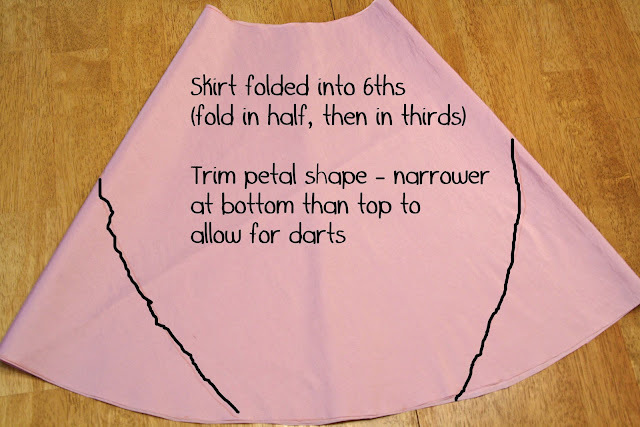 Yes, it was to the waist measurement, because you will take 4 inches out of each petal when you do the top darts. 4 inches x 6 petals = 24 inches that you need to add. Do you think this could be tweaked for an adult? There is an annual Tulip Festival where I live and think it would be cute for an adult to wear this as well to that event. Using the same technique as above, you could definitely adapt it for an adult; just plug in the adult’s measurements.